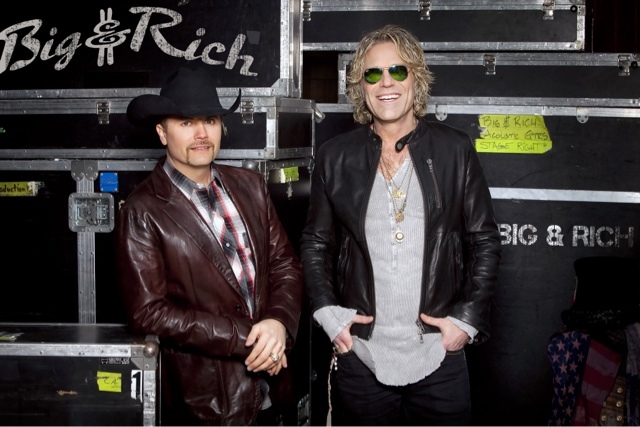 NASHVILLE, Tenn. (December 23, 2015) – Nearly 12 years after the release of their debut single, Country chart-topping duo Big & Rich continue to hit new highs with their latest album, Gravity. They look to build upon their current momentum with the upcoming single, “Lovin’ Lately” featuring Tim McGraw. The song is accompanied by the video starring McGraw, which is part of The Gravity Quadrilogy video series. Fans can check out the Trey Fanjoy directed video now, which was recently spotlighted by CMT.com. “Lovin’ Lately” is the follow-up to the smash hits “Look at You” and “Run Away With You,” also from Gravity. For the first time in their storied career, the duo snagged back-to-back Top Ten singles on Country radio. Their larger-than-life personalities and unique vocal style has helped to propel them as one of the most in-demand acts in the genre. The multi-platinum recording superstars will close out their monumental year on December 29, where they will kick off the Battle of the Bands at the Annual Franklin American Mortgage Music City bowl in Nashville. Big & Rich will hit the road in 2016 for several upcoming shows throughout North America, beginning with the IntelliCentrics Outdoor Concert Series and NHL Fan Fair™ presented by Bridgestone during the 2016 Honda NHL® All-Star festivities in Nashville on January 28.